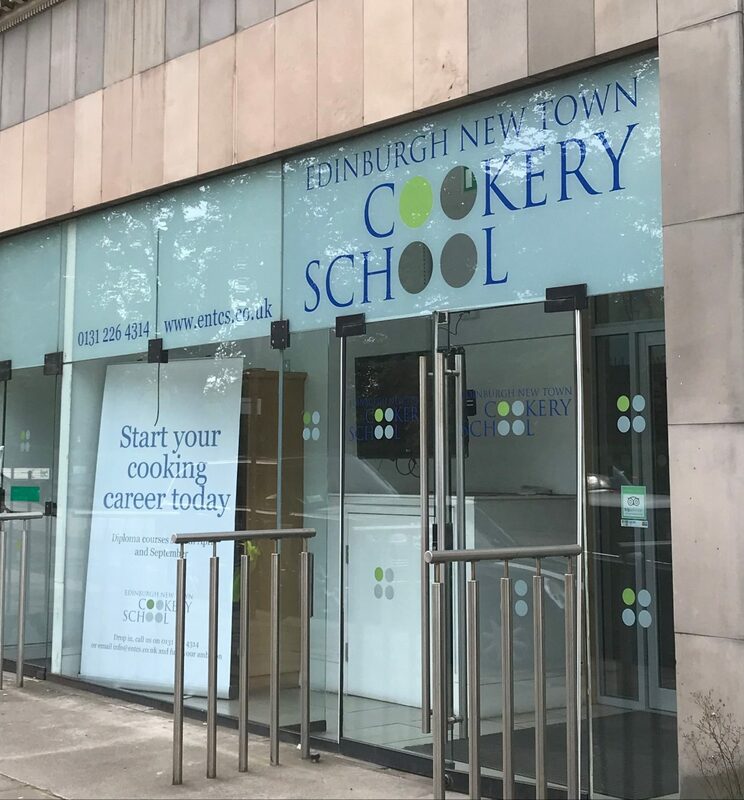 Edinburgh New Town Cookery School (ENTCS) is located on Queen Street in Edinburgh and has gained an enviable reputation for helping students to improve their cooking skills. The school offers wannabe chefs a range of day, week, month and six-month courses in their well-appointed classroom kitchen. 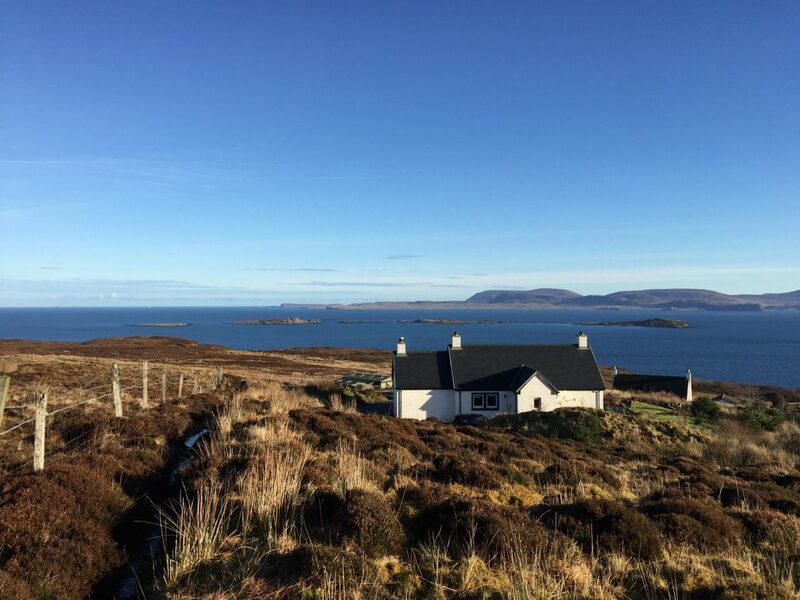 ENTCS won Best Cookery School for 2017 in The Food Awards, Scotland. 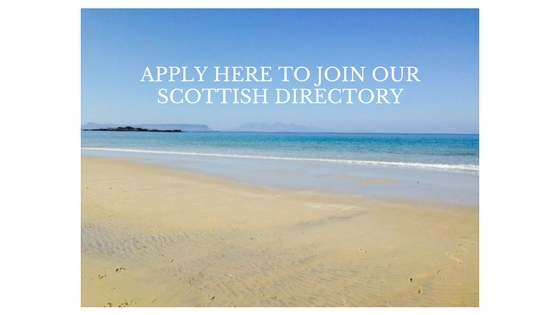 Situated in the heart of Edinburgh, the views over the New Town towards the river make this the perfect environment to relax and learn something new. 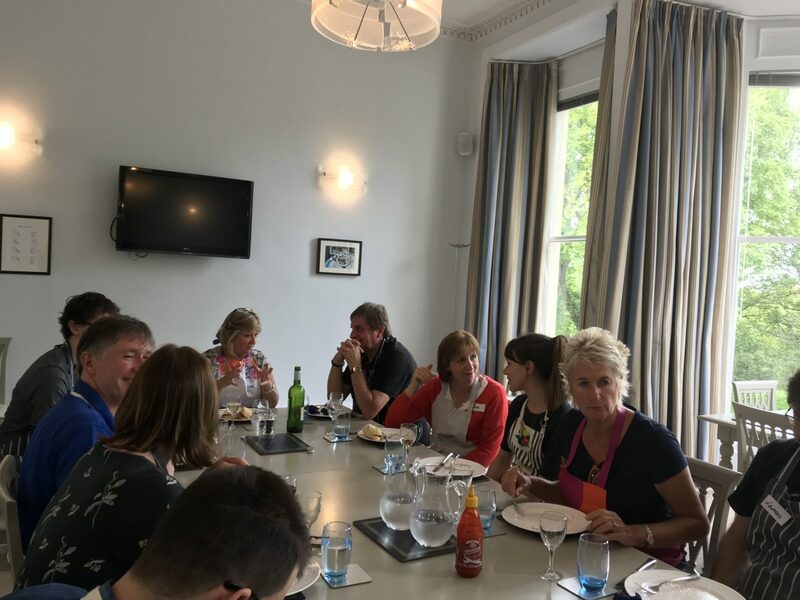 We were first introduced to the school earlier this year, learning how to cook the perfect steak and had a thoroughly enjoyable evening. When we were invited along to try one of their day courses we jumped at the chance. Whether you want to train to become a chef or update your Christmas baking skills, there’s a course at ENTCS for you. 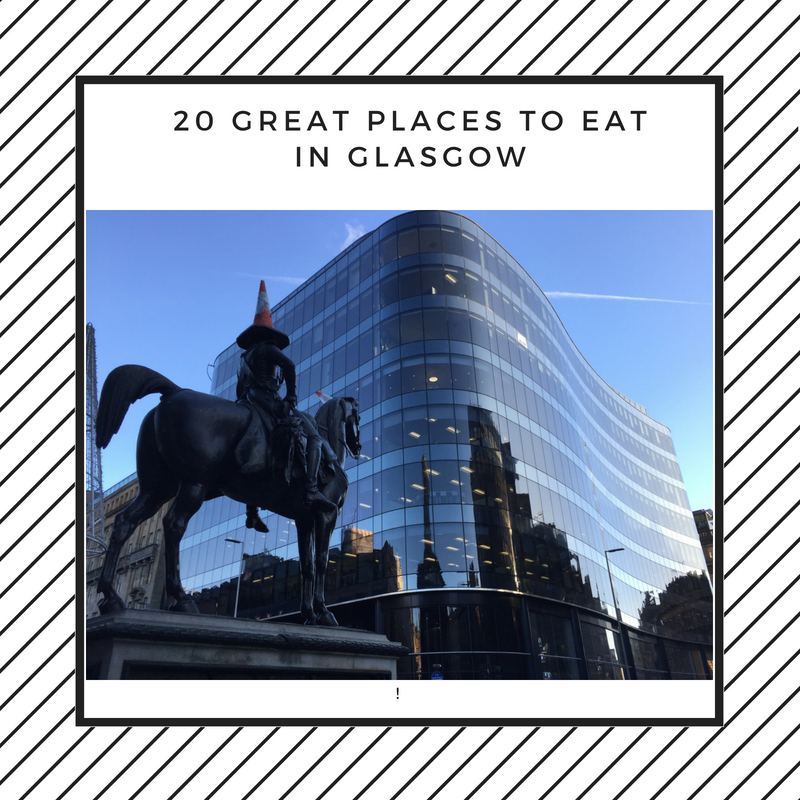 Many students have gone on to work in top restaurants around the world after taking the school’s Six Month Practical Cookery Diploma. 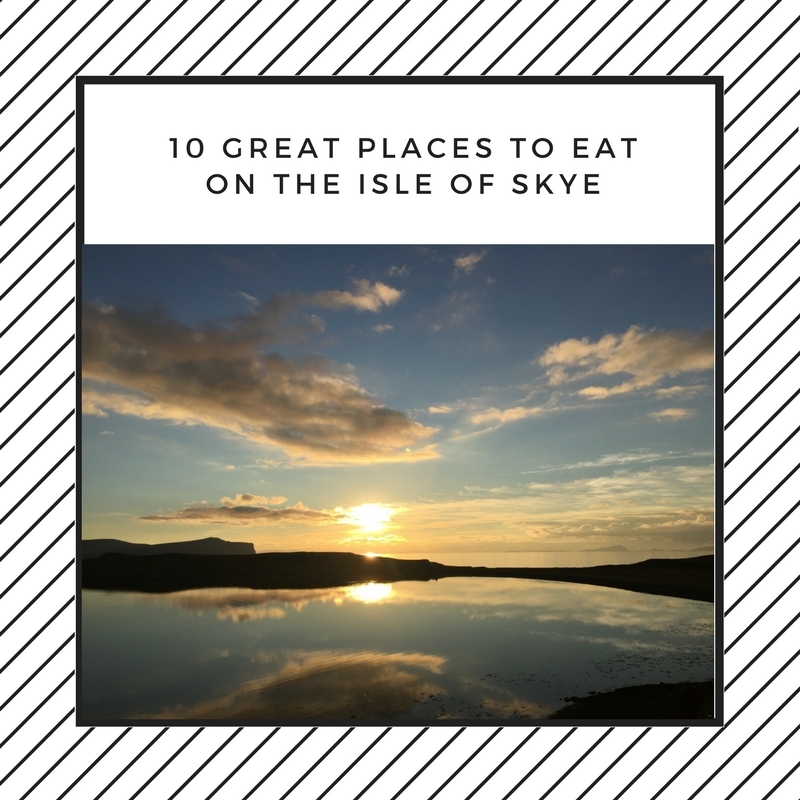 Raymond and I were going along to experience one of their day-long short courses but the thought of being able to lock ourselves away for six months with fellow foodies and learn how to cook professionally was quite appealing! Coming out of the six-month dreamland, the big question was – which one-day short course would we choose? That was a problem as there were so many options available. 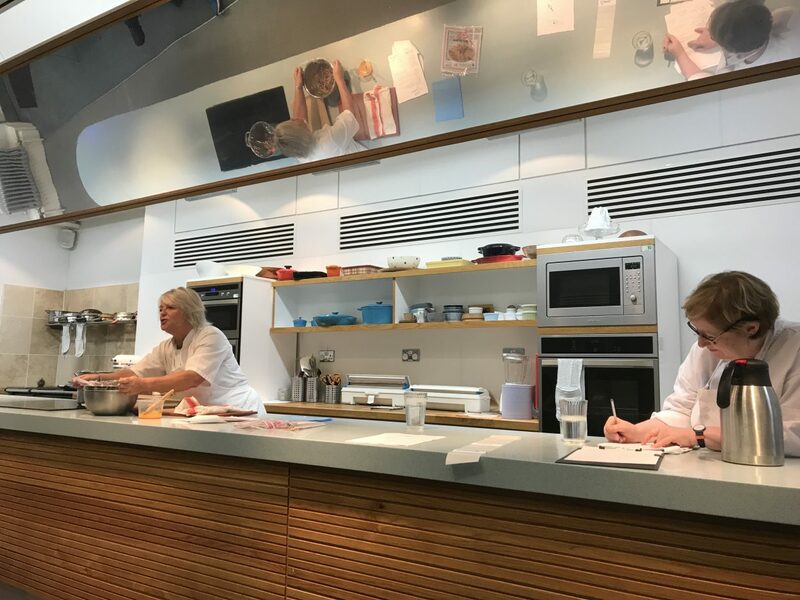 Aga workshop; artisan bread for beginners; chocolate Heaven; cooking with game, baking for beginners, curries of the world, flavours of Spain, delicious desserts, gluten-free baking are just a small selection of the options available. Eventually, we decided to enrol for the Vietnamese Cuisine course. With little experience of either creating or eating Vietnamese foods, we thought it would be an excellent introduction. Vietnamese cooking is one of the healthiest cuisines in the world and is all about the balance of our five taste senses – sweet, salty, spicy, sour and bitter. The food is bright and colourful and uses lots of fresh vegetables and herbs. On our course, we would initially watch chef demonstrate some dishes and then move to the kitchen and make our Vietnamese feast. Lunch would be eaten communally with beer and wine (like the sound of that!). The afternoon session (wine willing) would see us making further dishes to take home for our dinner. It sounded like it was going to be a great day. Arriving at around 9.30am with our bag of Tupperware (to take our dinner home! ), we couldn’t wait to get started. Students gather in the lecture theatre for tea and shortbread, and the course begins at around 9.45am. Our teachers for the day were the lovely Joanne and Sue from ENTCS. They gave everyone a warm welcome and guided us through the plan for the day. Joanne had spent some time in Vietnam and as it turned out so had many of our fellow students. They all raved about the food. Our morning session at ENTCS started with a demonstration from Joanne of how to create Crispy Vegetable Spring Rolls. They are very easy to make, and you can be creative with your fillings. Spring Roll wrappers are available from most Asian supermarkets and are inexpensive. When it’s so easy, why wouldn’t you make your own? They taste much better than shop bought ones and you have the benefit of knowing what’s inside. Joanne made a large batch for us to enjoy at lunchtime. Our next job was to make Banh Mi, to eat for lunch. 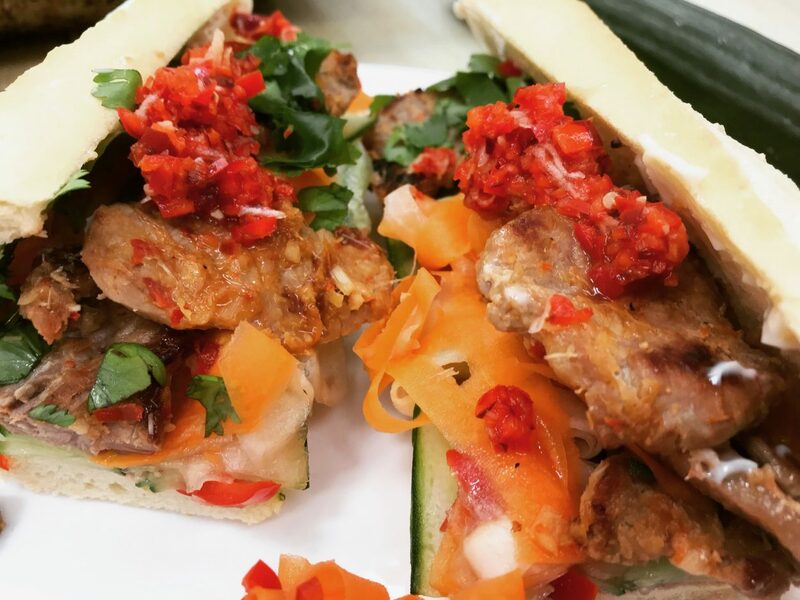 Made from a crusty baguette, paté, mayonnaise, marinated pork fillet, delicious vegetable pickle and a chilli sauce, the combination of ingredients highlights the French influence in Vietnamese cuisine. It sounds like the flavours shouldn’t work together, but it was delicious. The recipe for two people included eight hot chillies, so we expected the dish to be hot hot hot. Interestingly the balance of flavours from the sugar, rice wine vinegar, ginger, lemongrass and limes took much of the heat away and left a deliciously rich taste with perfect heat. At around 1 pm we sat down to a delicious meal with the proceeds of our morning’s toil. The beautiful dining room overlooks Queen Street Gardens and is a peaceful haven above the city. White or red wine accompanied our feast – soft drinks are available for any drivers. There was a real buzz around the table with everyone chattering about the morning’s activities. In addition to our Banh Mi, we also enjoyed Joannes’s crispy vegetable spring rolls, which were very tasty. 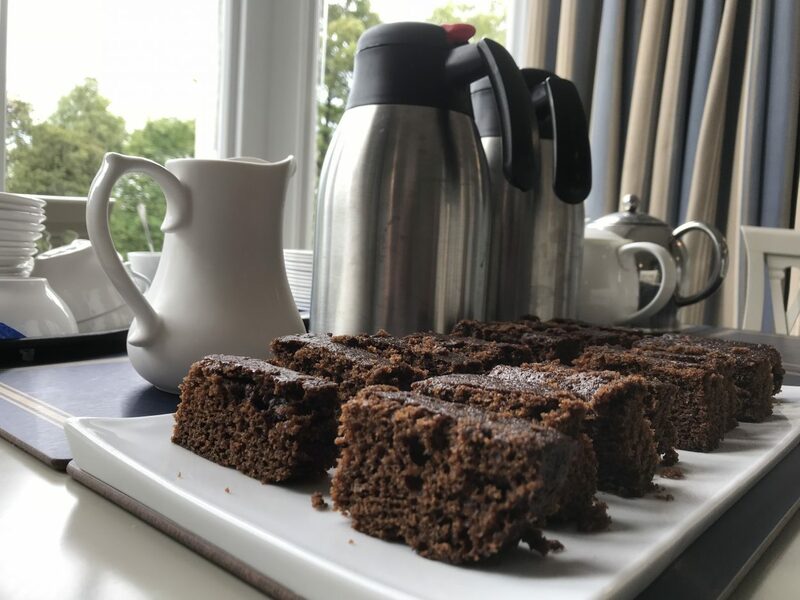 Coffee and homemade gingerbread perked us up again, ready for the afternoon session. Throughout the afternoon we would be making three dishes to take home for dinner. 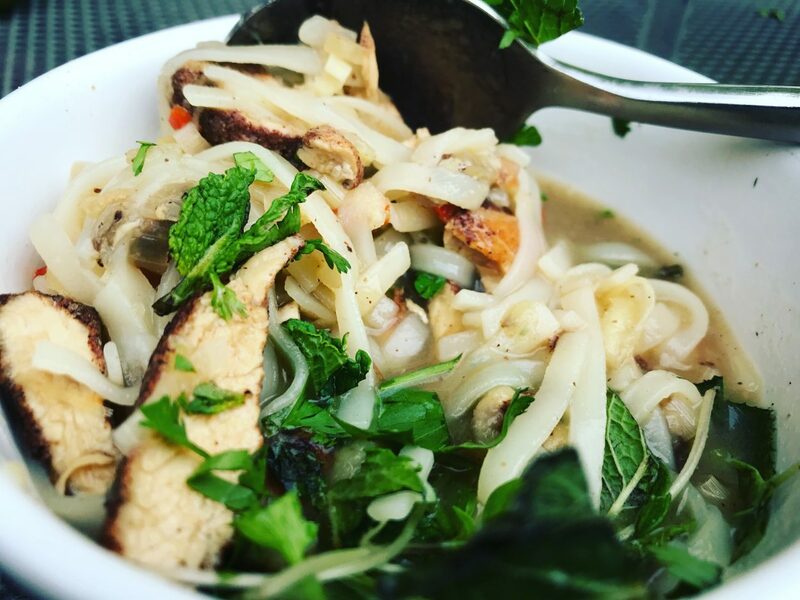 Pho Ga was first up – a Vietnamese soup of noodles and chicken. Joanne and Sue had been making fabulous chicken stock with carcasses for us to use as the soup base. 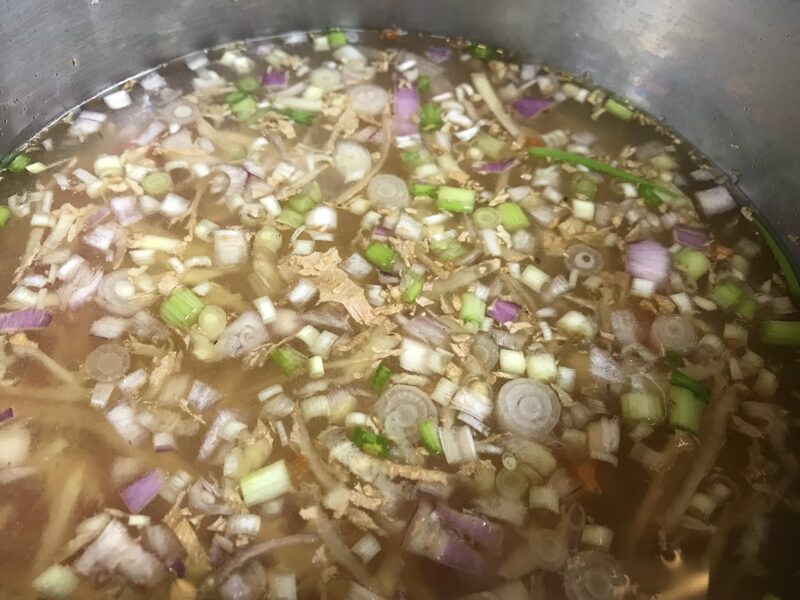 We learnt that you should never add starchy vegetables to your stock or let it boil as this makes your stock cloudy and it will have less flavour. Chilli, lemongrass, spring onions, banana shallot, fresh ginger, lime juice and fish sauce are then added to the stock. We then cooked chicken, marinated in cinnamon, nutmeg and coriander which was added to the soup to allow all the flavours to combine. 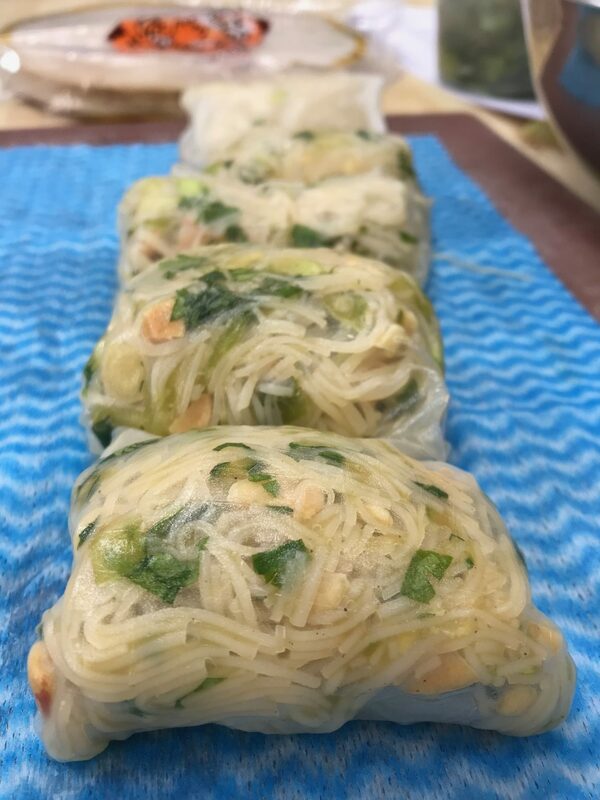 At home, we would add the wide rice noodles and finish off with a garnish Thai basil leaves (delicious with gin! ), mint, coriander leaves and a squeeze of lime juice. The result was a light and fragrant broth that was still hearty enough to be a meal in itself, and it got a big thumbs up all around. Next, we made the different components of our main course for dinner, Banh Xeo. 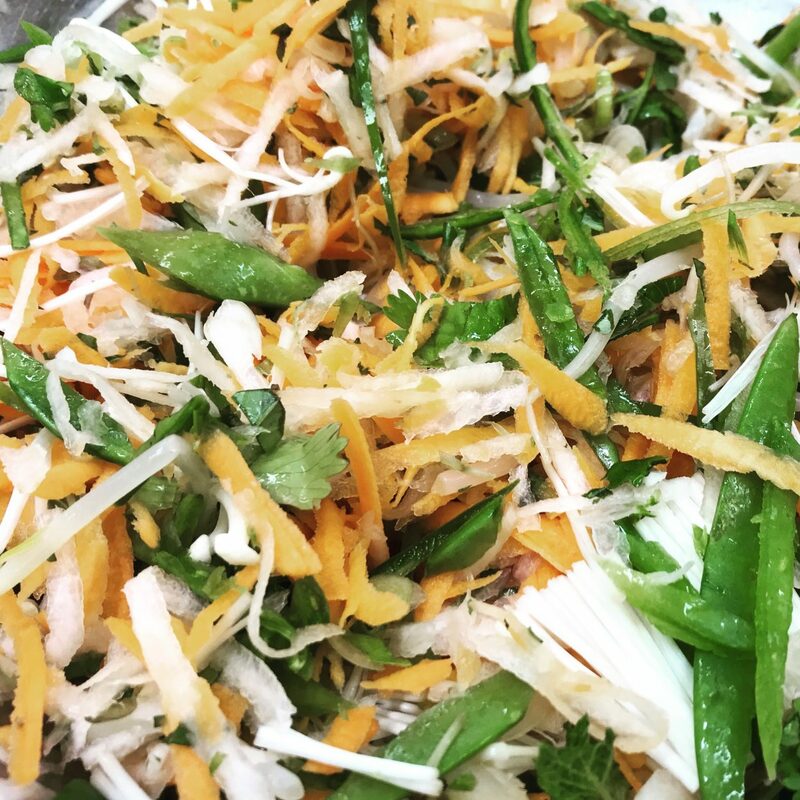 This dish comprises coconut and turmeric pancakes with a delicious carrot, mooli, spring onion, chilli, mangetout, beansprout and enoki mushroom filling. A delightful light sweet and sour sauce was also made to accompany the dish. We cooked the pancakes and assembled the recipe at home as it wouldn’t have travelled well. The pancakes took a couple of attempts to master and while they didn’t look the best they tasted delicious. 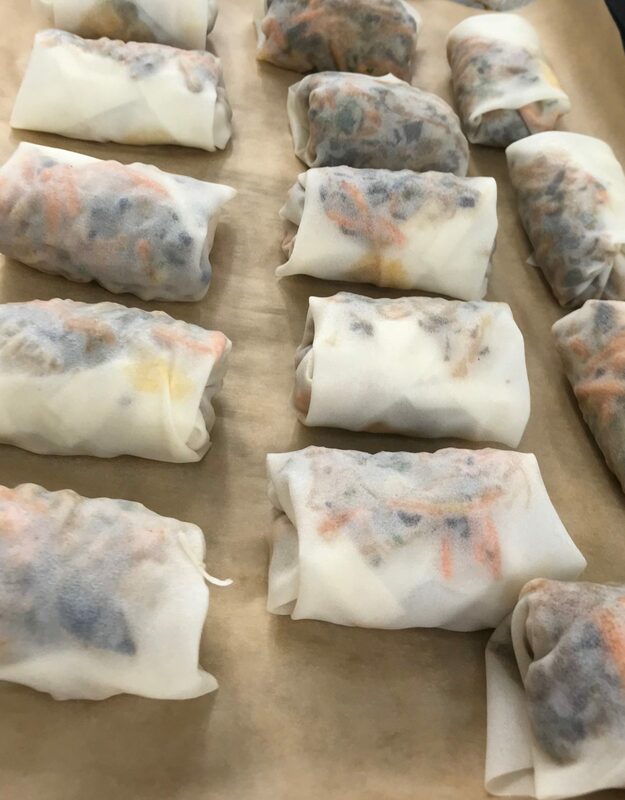 Our last creation of the day was Vietnamese Summer Rolls. Rice paper wrappers were softened in water until they became translucent and then we laid them out on a damp towel. Our filling of rice noodles, prawns, cucumber, mint and spring onion with lime, fish sauce, soy sauce, ginger and coriander dressing on top. A lesson in origami followed with each side folded into the centre, the bottom turned up over the mixture like an envelope and then rolled, tucking the sides in as we went. Easier said than done! It’s fair to say that our rolls improved each time we made one. We also made a Nuoc Chum dipping sauce for the rolls with fish sauce, lime juice, spring onion, chilli, sugar and coriander. A great day and so much food to take home! 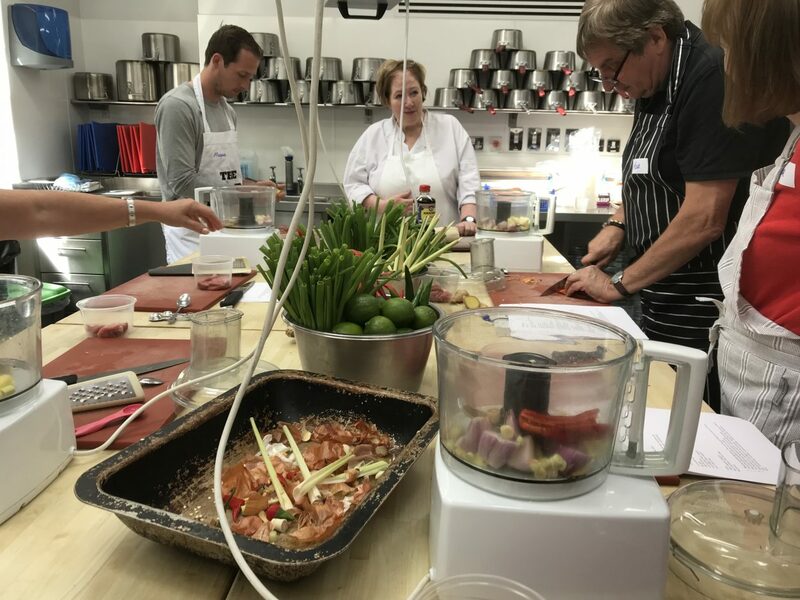 We had a thoroughly enjoyable day with our classmates at ENTCS Vietnamese Cuisine one day course. Right from the minute you arrive, you feel welcome and are excited about the day’s cooking ahead. The staff are all so friendly and want you to learn new cooking skills during your time with them. The pace of the day is excellent although time passes in a flash. 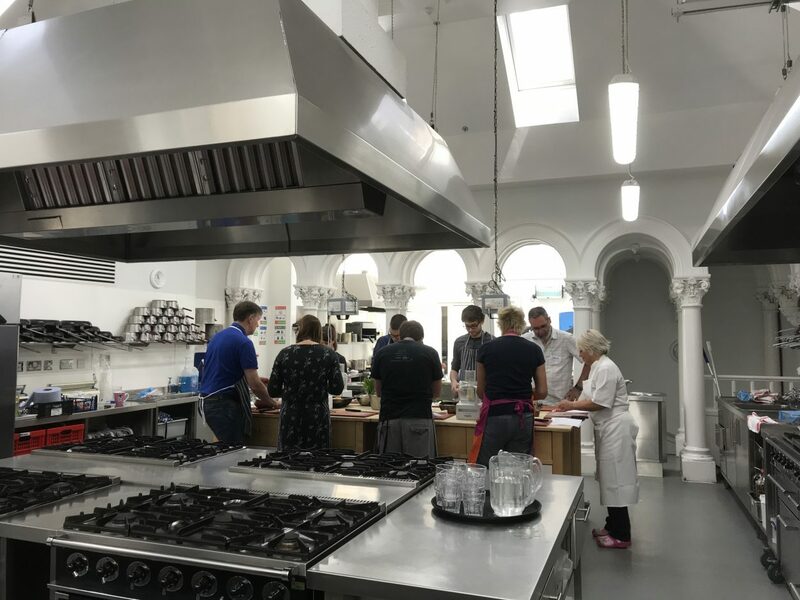 Whether you are looking to learn about different cuisines or to pick up new skills in the kitchen, we thoroughly recommend investigating the courses on offer. Similarly, if you are looking for a fantastic gift for friends or work colleagues, then a gift voucher for one of ENTCS courses is an excellent present to receive. 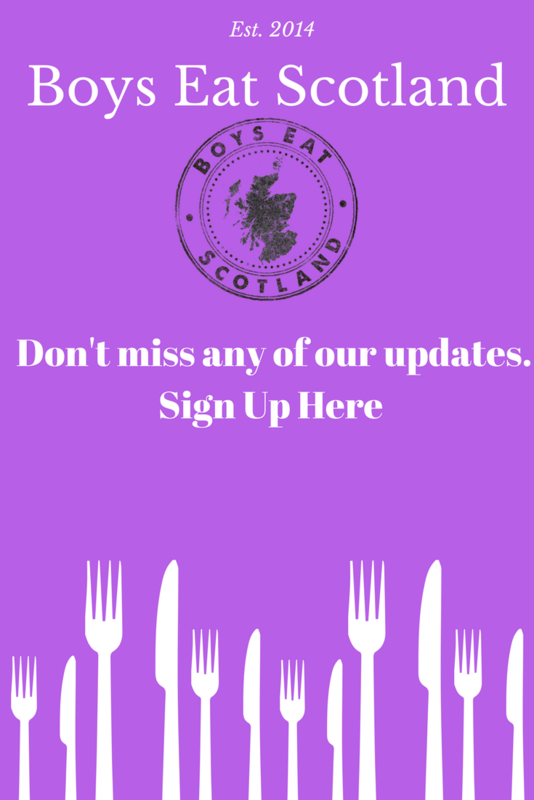 If our day is anything to go by the recipient will have a fantastic sociable day and come away with new recipes to try at home, the inspiration to cook more and a bag full of food to enjoy at home. Make sure you get an invite to dinner the night of their course!